A magical world of ice, snow and unique wildlife – this is Svalbard in a nutshell. One of the northernmost inhabited places on earth, about halfway between the European mainland and the North Pole, this incredible archipelago is a haven for Arctic wildlife. A few species live here all year long but, in summer, mass migration of birds, land and marine species turns Svalbard into a thriving hub of animal activity, making this one of the top 3 destinations in the Arctic for wildlife-viewing. Most especially of polar bears, a wildlife highlight for which Svalbard is world-renowned. 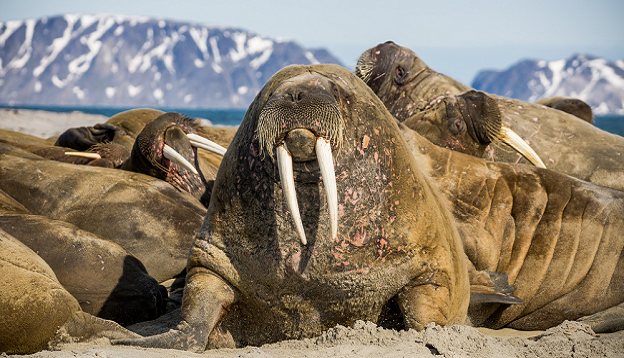 Here are just some of the stunning creatures you could meet in Svalbard. The King of the Arctic and the most beloved wildlife of all, the polar bear is considered an indicator species for the health of our planet. For this reason, this formidable hunter has become the unwitting poster-child for the fight against global warming and is at the top of most visitors’ wish-list. Many aim to see them ‘before they all disappear’ yet although they are now classified as endangered, the situation isn’t quite so dire – just yet. Svalbard is home to about 3000 bears and is considered one of the best spots in the Arctic to see them in the wild. In summer, they roam the coastal areas looking for delectable seals and tend to move to the far north where pack ice – and food – is present. Females breed every three years or thereabouts and will keep a close eye on cubs for their first few years of life. The polar bear is one of between 15 and 20 marine mammals that can be spotted on an expedition to Svalbard. 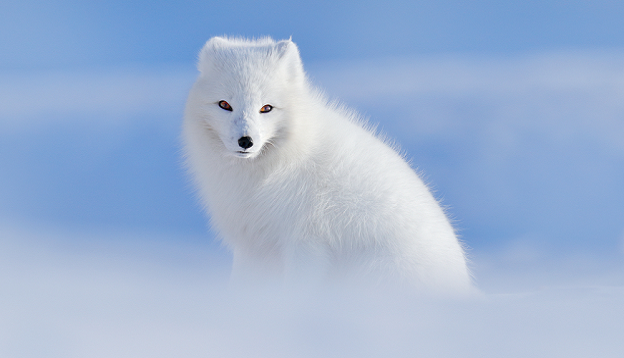 One of only three terrestrial species found in Svalbard, the Arctic fox is about the cutest canine you’ll ever see. A cunning and very resilient animal, the Arctic fox lives further north than any other land creature and is one of the few who lives here, all year long. It can withstand temps of -70-degree C and digs complex tunnel systems underneath the frozen tundra to help it cope with the immensely harsh conditions. 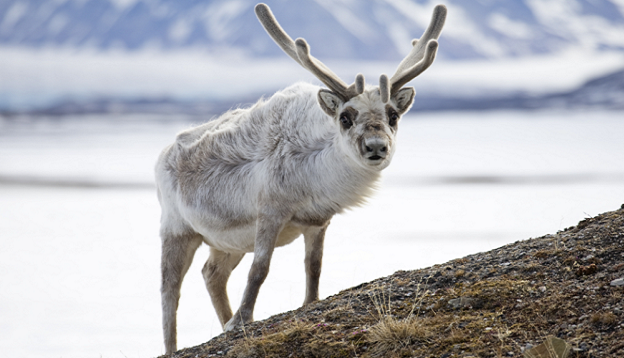 Closely related to the Caribou found in the Arctic regions of North America, the Svalbard Reindeer is distinctive in that it tends to stay in its region and is quite sedentary, unlike its American cousin which migrates extensively. Although the smallest of its kind, this regional subspecies is still a decent size with females weighing an average of 53kg in summer (which is when you’ll likely see them) and males around 65kg. Scientists have recently discovered that over the last decade and a half, the Svalbard reindeer seems to have lost about 10% of its body weight and they believe this is due to climate change. Reindeer may well stock up on grass in summer and autumn but it still very much relies on lichens (which survive under the snow) in winter. The ominous temperature increases across the archipelago in winter has meant that instead of snow, Svalbard is receiving much more rain instead – which freezes the ground and prevents reindeer from reaching their needed food source. This means that by the time spring comes, pregnant female reindeer are smaller than they used to be and, consequentially, give birth to smaller calves. By the time the walrus was protected by law in Svalbard in 1952, it’s believed only a few hundred individuals were left. Nowadays, about 4000 thrive in the waters along the north and northeast of Spitzbergen, hanging out in great numbers (up to 100!) either feeding on shellfish on the sea floor or sunbathing lazily on rocky beaches. 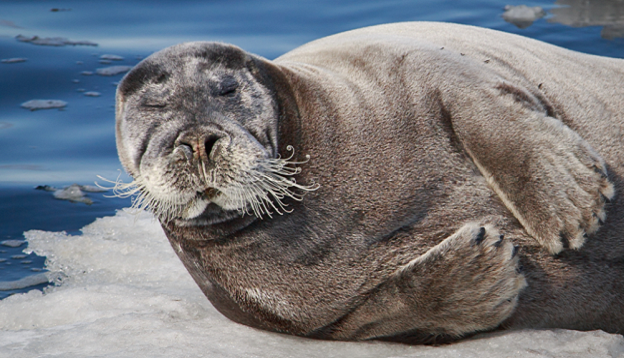 Although large and prone to fighting during the breeding season, this large pinniped is actually a gentle giant. Walruses are usually seen on shallow shores around Svalbard – their favourite spots – where they can easily feed and rest intermittently. After being hunted to within a whisker of extinction, whales have also made a great comeback to Svalbard and your chances of seeing them are quite good. Typically, whales in Svalbard are seen in July and August although the yearly increase in global temperatures means they now seem to be heading this far north as early as June. The five species most commonly seen around these Arctic waters are blue whale (the largest animal on the planet), humpback (arguably the most enjoyable to watch thanks to its acrobatics), fin whale (the second largest animal yet much, much smaller than the blue), Beluga (often spotted in groups, near land) and the minke, the smallest of the lot. 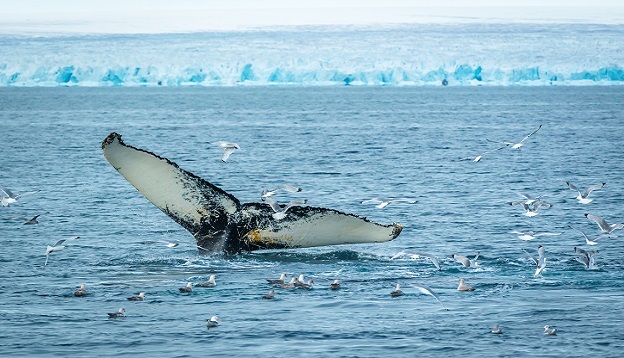 The waters around Svalbard are nutrient-rich in plankton and krill, the whales’ main food source, which is what attracts them to the region in great numbers. Killer whales, bowhead, sperm and pilot whales can also be spotted around Svalbard, albeit less commonly. Four main species of seals are found in exceptional numbers in the Arctic waters of Svalbard and this is one of the best places in the world to see large colonies of various species. Ringed seals are believed to number at least 100,000, bearded seals (the largest of the lot) love chilling out on ice floes in Svalbard’s many fjords, harbour seals trawl the waters on the western and northern coast of Spitzbergen island and harp seals, which are small and immensely playful in groups, are most often seen around drift ice in open water. A true bird-lover’s paradise, Svalbard attracts over 30 different species during the summer and can be seen in impressive numbers. These are, by far, the most numerous faunae in the region. Most of these are seabirds and they start arriving as soon as the ice melts on the rocky cliffs, offering a wealth of caves and nooks where they can breed in peace. The most distinctive Svalbard bird is the puffin, of course, but they are not usually seen en-masse here, preferring the slightly warmer temps of Iceland and the Faroe Islands instead. What you will see in great numbers are guillemots, skuas, auks, gulls and geese, as well as the Northern Fulmar, red-throated divers and the Svalbard rock ptarmigan, the largest land-based bird to overwinter here. 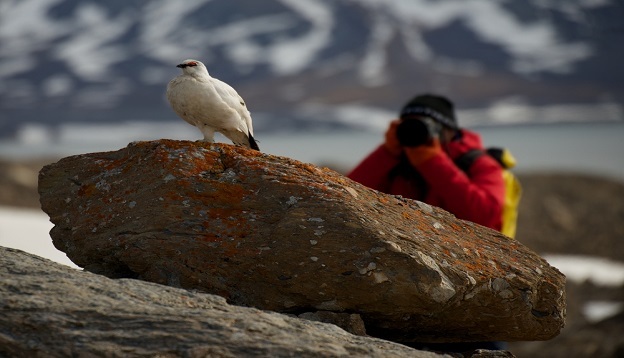 Summer is an absolute feeding frenzy for birds in Svalbard and if you’re an avid bird-spotter, you’ll be truly in your element. The best way to view wildlife in Svalbard is by spending a few days in Longyearbyen to take advantage of hiking excursions to one of the many national parks, before joining an Arctic expedition cruise to explore the coastal areas, especially in the north, where wildlife congregates in packs. Combined, this land + sea option offers the best chances for the most comprehensive wildlife viewing of all. July and August are particularly rewarding months to visit. At Chimu Adventures, we love to squeeze as much action and wildlife-viewing into our Arctic expeditions from Svalbard as we can. We offer a kaleidoscope of adventures of varying duration and budgets and can help you plan a sensational journey to the far north. See our Svalbard Arctic Expeditions and contact us for more info. 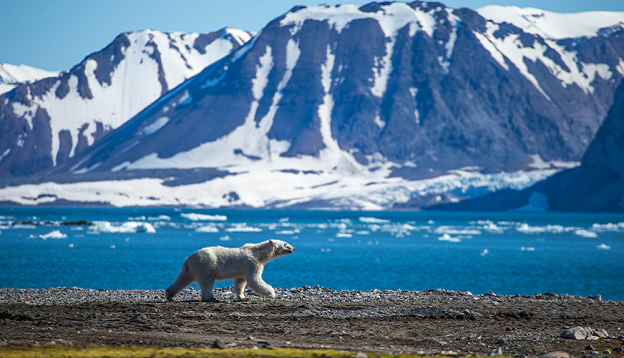 This Arctic voyage of discovery sets sail from Longyearbyen to circumnavigate Spitsbergen, the largest island of the Svalbard archipelago, a spectacular area of untouched wilderness and incredible Arctic wildlife including polar bears. See natural wonders such as Monaco Glacier, Edgeøya and Kvitøya, covered almost entirely by an ice cap. Make a stop at the fishing village of Sommarøy, before ending this Arctic adventure in Tromsø, starting point for some of history’s great Arctic expeditions.